Once in a blue moon an idea comes along that once heard seems so obvious that you wonder why somebody hasn't written about it before. 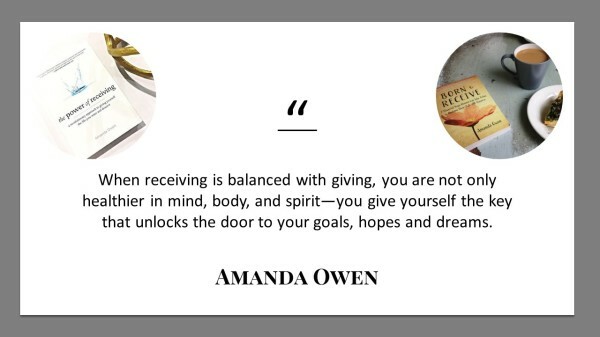 Amanda Owen's The Power of Receiving: A Revolutionary Approach to Giving Yourself the Life You Want and Deserve presents a new paradigm for the 21st century-a philosophy that values receiving as much as giving and demonstrates that giving is enhanced when receiving is embraced. 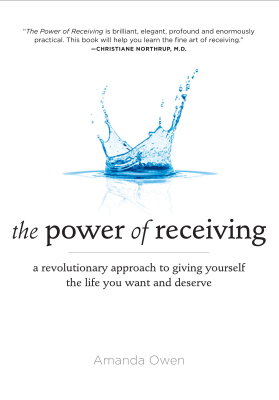 With the formula: Believe + Receive = Achieve, The Power of Receiving presents a wholly original yet easily accessible road map for people to follow, showing readers how to restore balance to their over-extended lives and attract the life they desire and deserve. Inspiring stories are featured about people who have experienced life-altering results after becoming skilled Receivers, including Ken who regained his hearing after a devastating hearing-loss, Julie who met the man she would later marry, and Don who received an extra $1,000 a month in his pay check.